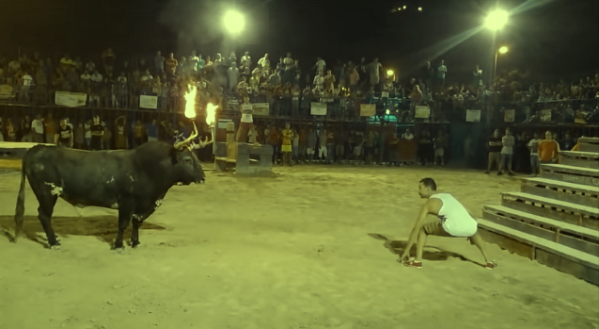 Bull With Horns On Fire Gets Mocked By A Man. The Man Then Gets What He Deserves. Spain is known for its festivals and cultural traditions that often involve bulls. Spaniards seem to enjoy running with the bulls, fighting them, and apparently lighting their horns on fire then taunting them. One such Spaniard is the rather brave man in the video below. Pretending to be all macho with his white wife-beater, the man can be seen taunting and mocking the humongous bull which is standing just a few feet away from him. The bull's horns have been lighted on fire. For a moment, it just stood there, seemingly uninterested in the Spaniard's foolish antics. But then the man started throwing sand at him. That's when he charged, flaming horns and all. The man tried to escape by climbing a flight of makeshift stairs that seem to have been placed for the main purpose of serving as an escape platform for men inside the arena. Too late. The bull's flaming horns were on the man's skin even before he could take a few steps on the stairs. He got flipped into the air like a rag doll. He ended up falling back on the ground. Limp and helpless. Fortunately for him, the bull didn't decide to unleash even more punishment upon him. The man was eventually rescued and dragged to safety by several men. The incident happened during a bullfighting event in Mislata, a small municipality near the city of Valencia in Spain. Apparently, lighting up the horns of a bull is a tradition in many parts of Spain. A wood and steel frame is attached to the bull's horns. Torches soaked in pitch would then be attached to this frame. This is different from the one seen in the video below because it seems like the horns themselves were lit on fire. More details about the practice here.